Say what you want about the Gateway LT3100's AMD processor and operating system options, but at least it had an angle. 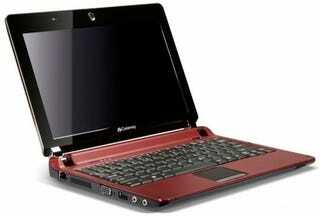 The $300, Atom-based 10.1-inch LT2000, on the other hand, is as predictable as netbooks get. SAN JOSE, Calif., July 20, 2009 – Gateway Inc. today introduces the Gateway LT2000, a new sleek and compact netbook with a 10.1-inch TFT LED-backlit display that will let mobile customers maximize their time on the go to stay connected and productive. At the core of the Gateway netbook line is excellent mobility and wireless communications, so customers can shop online, browse websites, make VOIP(1) calls, and stay in touch with friends and colleagues via email and social networks. The Gateway LT2000 netbook line is powered by Intel Atom processors and can provide easy access to the Internet via Wi-Fi 802.11b/g. "The new sleek Gateway LT2000 netbooks let customers do more with their time on the go – from enjoying the Internet to video chatting and staying in touch via email and social networks," said Ray Sawall, senior product marketing manager for Gateway. "The expressive design is modern and stylish, looking perfect whether it's used for work or play." The new Gateway LT2000 netbooks are well-equipped with features that make them highly useful for enjoying life on the go. They come with a full 1GB of memory and 160GB of hard drive space(2), so customers have ample room for music, photos and other files. The integrated webcam is ready to go with a simple software click. Customers can capture memories with still photos and live video that can be posted to personal blogs and sites like YouTube and Facebook. Also, video emails and video conferencing calls offer a more personal way to stay in touch. The new Gateway LT2000 netbooks use the latest Intel® Atom(TM) processors to deliver excellent mobile performance while promoting extended battery life and power efficiency. The line provides up to 3 hours of battery life (3).